Just yesterday, Trump supporter and former senior editor for Breitbart, Milo Yiannopoulos said, “I can’t wait for the vigilante squads to start gunning journalists down on sight." Today, a shooter guns down journalists in Annapolis, Maryland. 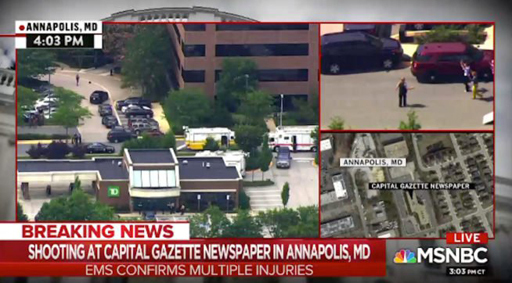 The Baltimore Sun is reporting a shooting has occurred at the Capital Gazette in Anne Arundel County, a paper that is owned by The Baltimore Sun, according to police and Capital Gazette staff. Anne Arundel County Sheriff says multiple fatalities have occurred, a suspect in custody and the building has been evacuated. As a result of the shooting in Maryland, New York City Police has sent extra protective forces to major media office buildings. It's worth noting that, on many occasions, Donald Trump has incited anger over the press to his followers. He's tweeted in the past, "The FAKE NEWS media is not my enemy, it is the enemy of the American people. SICK!" Republicans have fostered that sentiment. And now Americans are dead.